Creamy potato salads are delicious but after trying the dressing on my Vegan Nicoise Pizza I knew I had to throw the same dressing on some red skins. Try serving this over a bed of spinach, there will be enough dressing to go around. A far less vegan option but still delicious, would be to add some blue cheese crumbles, or dare I suggest bacon? Just a thought ok! Boil enough water to cover the potatoes. Once boiling add the potatoes and a pinch of salt. Boil until potatoes are fork tender 18-20 minutes. While the potatoes are cooking make the dressing by combining green onion, lemon juice, evoo, vinegar, and s&p to a small mixing bowl. Combine thoroughly, cover, and place in refrigerator until time to use. 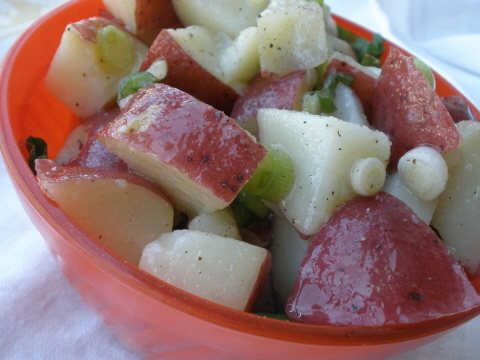 When the potatoes are cooked allow them to cool and then toss with dressing. Refrigerate at least one hour prior to serving if you can keep your fork out of it long enough.